It’s hard to describe New Orleans. Music plays, people eat, and the feeling of colorful stories haunts the streets. I took Corey to Café du Monde today. 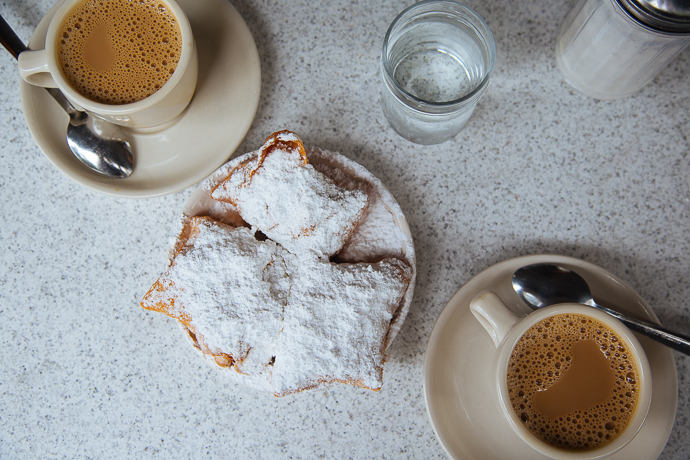 You could ski on the amount of powdered sugar Café du Monde douses on their world-famous beignets. I love this city. This city is a party. We stayed in the French Quarter to get the full experience. Bourbon Street is a party every night of the week. There was live music on the street and in every other venue. People were doing all kinds of crazy things for a few bucks. There was one man who stood balanced on a ladder like a magic construction worker. We saw a “teddy bear” in the middle of the street waving at passersby with the face of man. Upon closer inspection we saw a dirty tattooed man on his knees moving the bear costume with his hands. There were bros on balconies tossing beads below, but we didn’t see anyone flashing, as I know that’s what you do to win a 10¢ necklace and some self-esteem. We stayed at the historic Bourbon Orleans Hotel. In 1817, it opened as the grand Orleans Ballroom. Years passed by and it became a convent acquired by the Sisters of the Holy Family for orphans to live in and go to school. During that time, the Civil War and yellow fever caused the convent to open their doors to the ill and wounded. There are stories of ghost orphans who still play in the hallways and tug on coat jackets of guests, giggling as they run away. Another story tells of a suicidal nun regretful of her actions who watches over sleeping guests. There is also the Civil War soldier who still tries to find the front lines of battle; guests can hear him dragging his sword across the floor. The most eerie story is about twin brothers who fought to the death on the grand staircase over a beautiful debutant; the blood-stained carpeted floor has to be replaced often, because the ancient blood still bleeds through. Today we did a swamp tour. At one point we were surrounded by at least 10 gators. I never knew they liked marshmallows, but when the captain tossed them out, like a supper bell they came. There were some big boys 14ft long and 900lbs. Our guide took us into the deeper part of the swamp. We passed by homes that were destroyed during Katrina, and some that somehow survived. The water where we were had risen 16ft high, swallowing some homes and taking some miles down the river. Mother Nature can be incredible and terrible all at the same time. Deep in the swamp, we suddenly came upon a family of wild hogs. They call them “big squirrels” in the swamp. These guys knew the deal. They came right up to the boat and one huge hog just about jumped into the boat. They squealed and ran around in the muddy water having a good time. 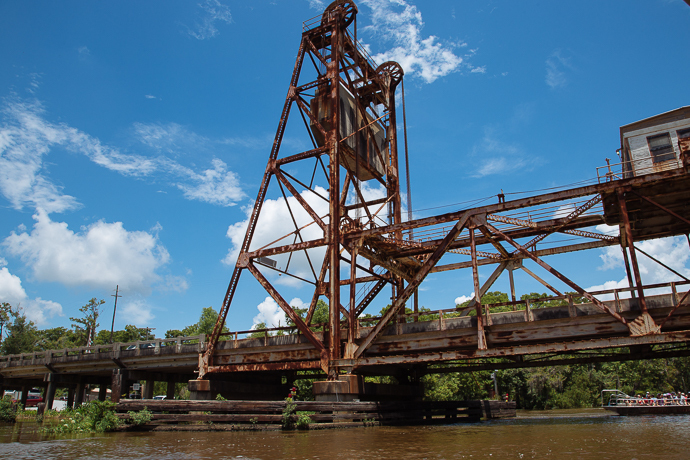 New Orleans had it all: Great food, delicious drinks, and good times. Thanks for the adventures, N’awlins, We’re going camping.